Whitewashing vs Neurodiversity? It doesn't have to be a choice. With Steven Silberman's book NeuroTribes, and Amy Lutz's recent article, "Please Stop Whitewashing Autism," the autism self-advocate vs. parent community fights seem to be picking up steam again. I don't plan to participate this time around. But I have been wondering about something new. Science has shown that there are not one, but many genes likely to cause autism (Dozens of Genes Associated with Autism in New Research). It seems as if the science is beginning to suggest that there is no single autism, or even a single autism spectrum. There are many sub-types, and as we learn more about the brain and the genetics, we may find that many of the people we classify as "autistic" may actually have a different disorder. In other words, Steve Silberman and Moe may have nothing in common at all. And when that happens, what will happen to all those self-advocates who claimed they were there for my son too? What happens when it turns out that they don't actually know any more than anyone else about what's going on in my child's brain? For the record, I'm not against the self-advocate community. Their message is powerful and vital: "nothing about us without us." Stop infantilizing the disabled. People with disabilities must have a say in their own care. Independence. Dignity. We must absolutely all rally around these tenets. But we must also recognize that it's not always that easy. Moe can't tell me he has a headache, let alone advocate for his housing rights. At least not yet. And as long as medication is the only way we've found to keep him from hurting himself and others, we will make the choice to use that medication for him. Yes, we listen to his communication in every form, but his message isn't always clear. Do I think autism is being whitewashed? I don't know. Maybe sometimes. I certainly don't believe that autism is a gift for Moe, nor that his brain just works a little differently. He is severely disabled. But his experience is no more or less valid than anyone else's. Let's all share our stories. Let's learn from each other, help each other out when we can, and when we can't, get out of the way. I've been having a hard time with religion lately. I should say that I've never been especially religious. Raised Jewish, I've never kept kosher, or attended temple much beyond the occasional bar mitzvah. But I have always felt a connection to being Jewish and to the community. Some of my happiest memories are around the Passover seder table or breaking the Yom Kippur fast. On Rosh Hashanah it is written, and on Yom Kippur it is sealed. How many will pass and how many will be created? Who in their time, and who not their time? Who by fire and who by water? Who by sword and who by beast? Who by hunger and who by thirst? Who by earthquake and who by drowning? Who by strangling and who by stoning? Who will rest and who will wander? Who will be safe and who will be torn? Who will be calm and who will be tormented? Who will become poor and who will get rich? Who will be made humble and who will be raised up? "Who by fire and who by water?" As I write about this, the third most destructive fire in CA history is burning. Did God write that an entire town should be destroyed? "Who in their time, and who not in their time?" And did God write that my brother who was, by the way, probably the most righteous of any of us, should die of a brain tumor at age 25? "Who will be calm and who will be tormented?" And did God write that my son should struggle so much? That he should spend his childhood injuring himself? This is not a God I want to believe in. If you ever want to know why Jewish guilt exists, look at that last line. If you die, or are poor, or get hit by an earthquake, it's probably because you didn't pray hard enough or weren't a good enough person. And here is the messed up part — despite my anger, despite every logical inkling, sometimes I still think that maybe this year I should try a little harder to believe. That maybe if I pray a little harder, if I'm better, then maybe Moe will be inscribed in the place where he can rest, and be safe, and be calm. My hands are looking pretty beat up these days, covered in scratches and scabs. My wrists too. Moe is having a rough time. When things are really bad, he bangs his head on the floor, the table, or any hard surface he can find. And Jeff and I (or our incredible nanny who pretty much deserves hazard pay by now) spend a lot of time trying to keep him safe. And we get a little scratched up in the process. I suspect he started off not feeling well, maybe with a sore throat. Then he started banging his head, leading to headaches, leading to more frustration and head banging. Moe doesn't like it when we don't let him hurt himself, so he scratches. And now my hands look like this. It's minor in the scheme of things. Whatever Moe is feeling to make him want to hurt himself and lash out at us, is worse. I know that. But it poses a bit of a dilemma for me. 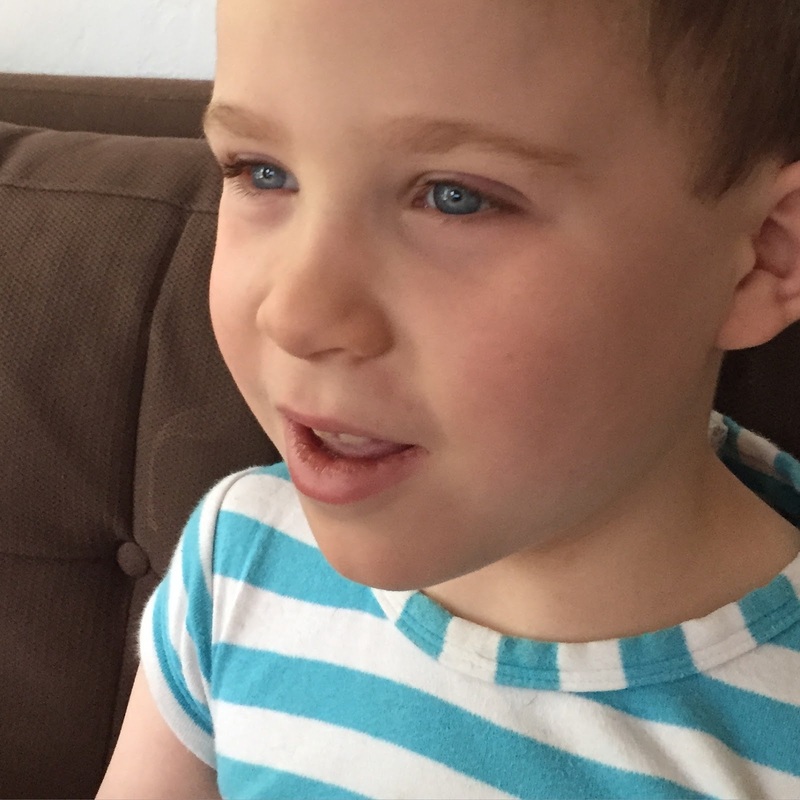 I work full time, and I don't hide the fact that my son is autistic. For one thing, I probably wouldn't have my current job if I hadn't started blogging about Moe. I had taken six years off before going back to work so when I started interviewing many of my writing samples were from this blog. So anyone who interviewed me knew at least some of this story. Most of my co-workers know as well. It's easier to have it be out there. I was nervous about that at first. It's hard enough being a working mom, let alone one with a special needs child. But it makes some things easier to explain, and you never know when you'll find a connection with someone with a similar story. Besides, as a blogger (read: oversharer), it would be more uncomfortable for me to hide this side of my life. So for the most part, I'm open about Moe. I work with kind and intelligent people who don't try to sell me on the latest fad cures, so I like it when they ask questions. They actually listen. So, when a co-worker notices the bandaids on my wrist and jokingly asks "tough weekend?" I don't make up an excuse about a cat or scratches from the garden. Yes, it was a tough weekend. But bringing the really hard stuff to such a visible place, not just on this blog but literally on my hands, can be difficult. Work is my escape from life with autism. I don't want those emotions at work and these scratches are a reminder of the hardest part of my life, watching Moe struggle. Worrying about his future. Getting beat up by my own kid. And I don't want that part, the worst part, to be how Moe is represented to the world. So let me show you the sweet side of Moe too. The one where he snuggles up to me and we hold hands, if only for a minute. And his eyes, such a bright blue when he smiles. A smile that is all too rare these days but that we don't stop fighting for every single day.